1. You can open Character Information Window with hotkey [C] or the character information button on the UI on the bottom of the screen. 2. Pet information window shortcut button and UI have been deleted. You can check pet information at pet tooltip, same as before. 1. You can open [Normal] tab at Character Information Window to open the basic information window. 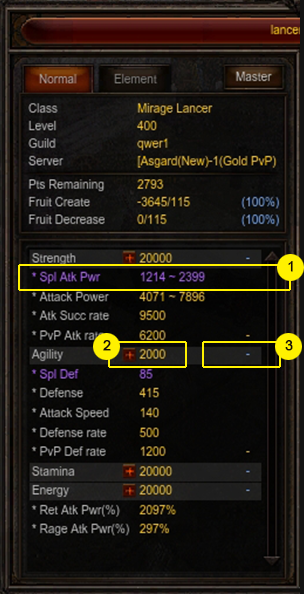 Displays specialized attributes below each stat (originally displayed with tooltip). Stats acquired through level up, fruits and with [increase stats] at master skill tree are permanent stats, displayed in yellow. 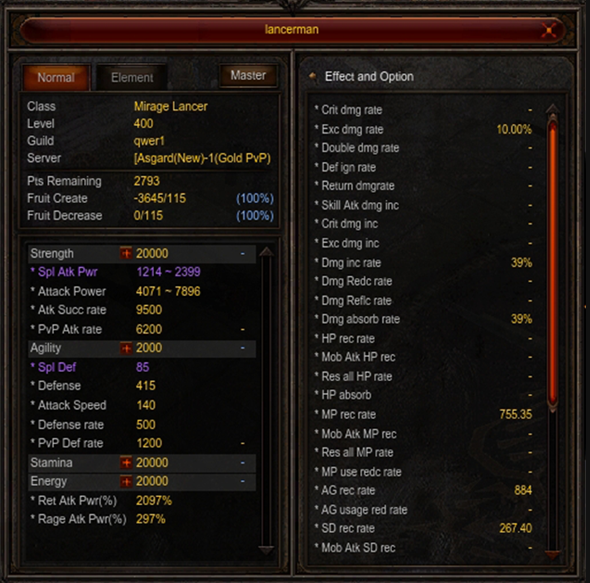 Stats increased at certain situations such as wearing equipment with options are variable stats, displayed in sky-blue color on the right side of the permanent stats. Required stats for wearing equipment must be fulfilled with only permanent stats. Required stats for acquiring and using skills must be fulfilled with only permanent stats. 1. You can open and close the Expanded Information Window by clicking the button on the right side of Basic Information Window or by using hotkey [Shift + C]. 2. Expanded Information Window displays additional effects and options such as equipment or master skill tree. Critical Damage Rate Crit dmg rate Displays chance for critical damage when attacking. Damage Chance Exc dmg rate Displays chance for excellent damage when attacking. Double Damage Chance Double dmg rate Displays chance for double damage when attacking. enemy's defense Def ign rate Displays chance for ignoring enemy's defense and afflict damage. afflicted by the enemy when being attacked. damage increase Skill Atk dmg inc Displays skill attack damage increase. when a critical damage occurs. when an excellent damage occurs. Damage increase rate Dmg inc rate Displays % value of damage increase when attacking. damage to the enemy when being attacked. HP recovery rate HP rec rate Displays amount of HP recovered at HP auto recovery. HP recovery Mob Atk HP rec Displays amount of HP recovered at monster kill. Chance to restore all HP Res all HP rate Displays chance to restore all HP when being attacked. with a chance at successful attack. MP recovery rate MP rec rate Displays amount of MP recovered at MP auto recovery. MP recovery Mob Atk MP rec Displays amount of MP recovered at monster kill. Chance to restore all MP Res All MP rate Displays chance to restore all MP when being attacked. MP usage reduction rate MP use redc rate Displays % value for skill MP usage reduction rate. AG recovery rate AG rec rate Displays amount of AG recovered at AG auto recovery. AG usage reduction rate AG usage red rate Displays % value for skill AG usage reduction rate. SD recovery rate SD rec rate Displays amount of SD recovered at SD auto recovery. SD recovery Mob Atk SD rec Displays amount of SD recovered at monster kill. Chance to restore all SD Res all SD rate Displays chance to restore all SD when attacking. with a chance when attacking. of increasing Absorb Shield rate. opponent's Absorb Shield rate according to options. afflict direct damage to opponent's HP at PVP. effect to opponent when attacking. Stun resistance rate Stun res rate Displays stun resistance rate when being attacked. Basic defense is not affected by ignore defense. by [Shield Block] at master skill tree. [Protection Shield] at master skill tree. [Weapon Block] at master skill tree. for obtaining Zen at monster hunting. 1. You can click on [Elemental] tab at Character Information Window to open the Elemental Information Window. Displays equipped Pentagram and your elemental information when Pentagram is equipped. Displays elemental damage, elemental attack success rate, elemental defense and elemental defense success rate, including options of equipped Pentagram and Errtel on the Pentagram added up. Displays skills attack damage increase by elemental imprint. Displays elemental attack damage and elemental defense rate against opponent's element. - Displays element interactions when Pentagram is equipped. - According to the element of Pentagram equipped by the character, on the top of the table elements stronger than you and on the bottom side elements weaker than you will be displayed in alignment. - For instance, if you have fire element Pentagram equipped, water and earth elements that are stronger than fire will appear on the top, and wind and darkness elements that are weaker than fire will appear on the bottom, aligned automatically. - When a fire element Pentagram equipped and the opponent's element is darkness, the attack damage rate is 110% and the elemental damage * 110% becomes the final attack damage. 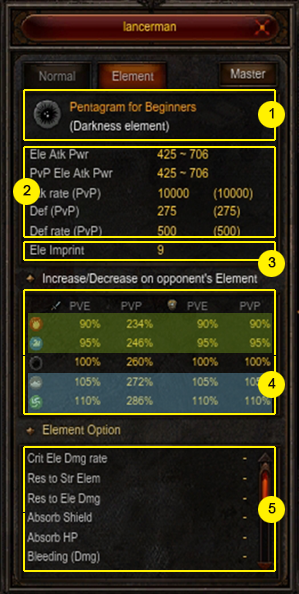 - The attack damage and defense rate is different depending on elements and PVE / PVP situations. Displays Pentagram's additional options, or Errtel's additional effect options. 2. The options displayed at Element Option Information are as follows. to be applied as critical damage. equipment for Pentagrams above Equip Level 180.
by an opponent with stronger element. that are stronger elements than fire. Errtel equipment for Pentagrams above Equip Level 180.
into SD with a chance. Errtel of Radiance rank up. invoking damages to the target with certain chance. and all recovery ability reduced by 90%. max HP when a critical elemental attack occurs. Blinding Blind (Redd Atk) Reduces target's attack success rate by % value. through Errtel of Radiance rank up.